St. Patrick’s Day, Academic Style! What a phenomenally Irish weekend! I didn’t do the things a tourist to Dublin normally does on St. Patrick’s Day (which seems to include a lot of roaming the streets while intoxicated). Instead, I packed my schedule full of St. Patrick’s Day Festival events. My friends an I pooled out ticket allotment so we could see many shows. I’ve pictured some of the events below (I didn’t even take photos at every event, believe it or not). The photos show how academics enjoy St. Paddy’s! You can see my brainy friends and me enjoying short films in the Examination Hall of Trinity, for instance. The group that coordinates the St. Patrick’s Day Festival did a fabulous job! I send my heartfelt thanks to them! 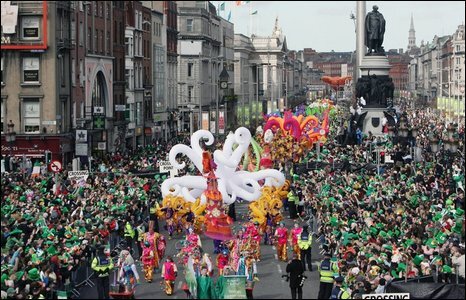 Incidentally, you’d be amazed to see the streets of Temple Bar on Sunday night: wall to wall people dressed in green velvet!?!! I elbowed my way through at 7 PM (I don’t even want to think what the place was like by midnight). Even at 7, I was clutching my belongings so tight that I forgot to take a photo! Turtle delivered his lecture at Marsh’s Library. I brought Toni Gray, Giuseppe Conte, and (former Fulbright scholar) Nancy Stenson along with me to the “I _ My City” film viewing. Nancy and I enjoyed a tasty late-night dinner at Café en Seine on Dawson Street. At the Chester Beatty Library, the show TEMPO fused Irish and Brazilian rhythms. I finally visited the Smock Alley Theater, for performance art (film+clarinet solos) that brought the eclectic space to life. I purchased a CD of “Zoë Conway Live” following this performance by the fillde player and her husband, John. She is a professional musician who plays with Riverdance (among other groups). The show included performances by one of Riverdance’s lead dancers, Zara Curtis. A past parade in Dublin, downloaded from Jim Small’s ND Go Irish Blog. Things are hectic here in Dublin. Almost as soon as Pam flew out two new guests arrived, Toni Grey and Giuseppe Conte. Unfortunately, plane tickets were so costly for travel to and from St. Patrick’s Day that they won’t be staying to partake in all the festivities. St. Patrick’s Day falls on 17th March. Originally, the day of celebration marked the arrival of Christianity in Ireland. That happened way back in 432. Today St. Patrick’s Day is a big party that celebrates all things Irish. This will be my first St. Patrick’s in Ireland and I’m excited to be a part of it all. I’ve been lucky to get some tickets for the St. Patrick’s Festival, thanks to the diligence of Tess who handled all the on-line reservations. The high point of the 17th will be the People’s Parade. It’s to have hundreds of carnival-type floats with people from the area on board. The parade will pass right by my apartment block. Stay tuned for pictures of this year’s events as they unfold….